This may just be one of the easiest recipes ever posted on this site; only FOUR ingredients for the base cake recipe and only an additional four ingredients for a delicious cream cheese frosting. It’s a great treat to bring to a party especially during the summertime! The actual cake recipe couldn’t be easier to make — we’re just mixing 4 ingredients together and spreading that mixture into a 9 x 13 pan. The four ingredients: first up, a yellow cake mix! 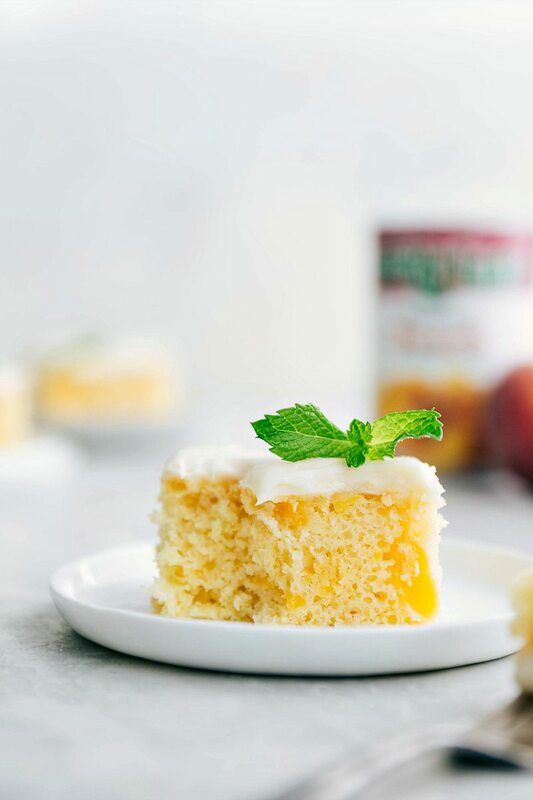 You can use any yellow cake mix you’ve got on hand, but I love the cake mixes with pudding added in. Next up, 2 large eggs and some full fat sour cream (adds a great moistness to the cake). 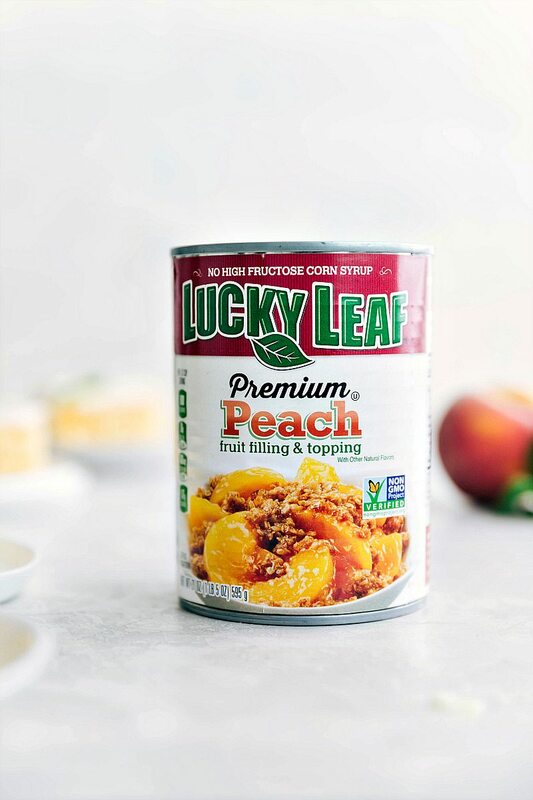 Finally, we add in an entire can of LUCKY LEAF Premium Peach Fruit Filling & Topping. 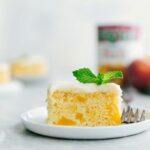 That fruit filling is really the star of the cake — it adds the flavor and thick chunks of delicious peaches throughout nearly every bite of this cake. 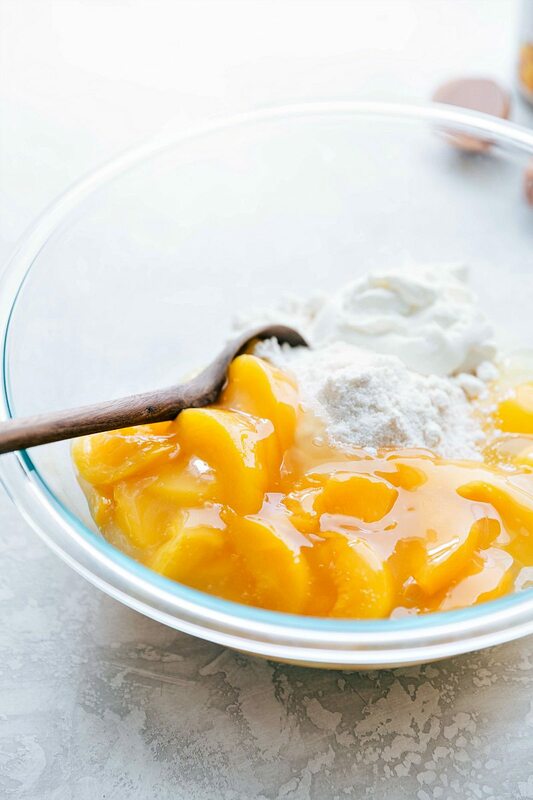 Once all the ingredients are in a bowl, stir them together until just combined making sure you don’t over-mix the batter. Spread it evenly into a greased pan and it’s ready to bake! For the cream cheese frosting, we’re keeping things just as simple with only 4 ingredients and 1 bowl! Beat together the softened cream cheese and butter plus some vanilla and then beat in the powdered sugar until smooth. I like using salted butter for this frosting to cut the sweetness just a bit, but unsalted works great too — just add in a pinch of salt. The most important thing for the cream cheese frosting is to make sure the cream cheese and the butter are both softened to room temperature. This will give you the perfect smooth and creamy base for the frosting. You don’t want the cream cheese or butter melted. They should both at the same room temperature for best results. 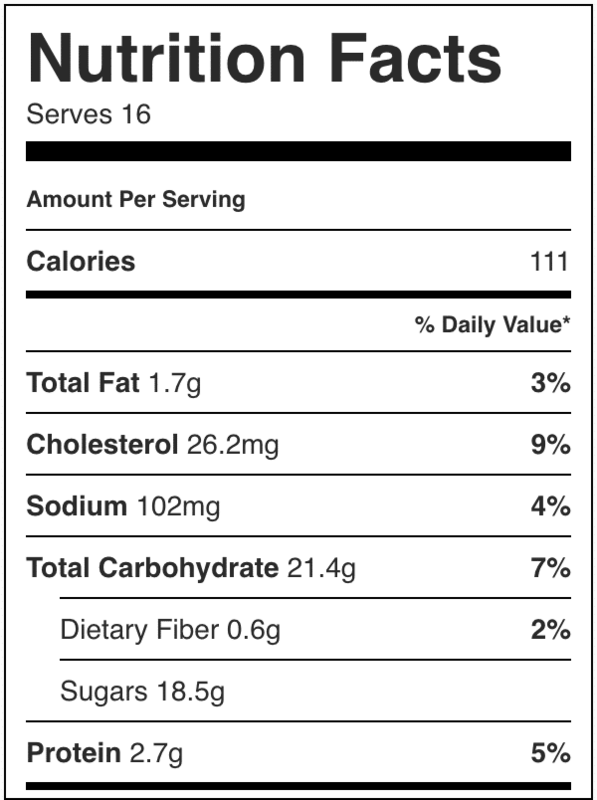 Combine first four ingredients in medium bowl. Mix until smooth. Spread evenly in a well greased 9x13-inch pan. Bake at 350°F. for 35 to 45 minutes, or until cake springs back when lightly touched in the center. Cool. Spread with cream cheese frosting. Combine cream cheese, butter and vanilla in a small mixing bowl. Gradually beat in powdered sugar until smooth. Spread evenly over the cake. Special thanks to Lucky Leaf for partnering with me on this post! Thank you for supporting the brands that I love to use! My mother and father-in-law love all peach desserts. 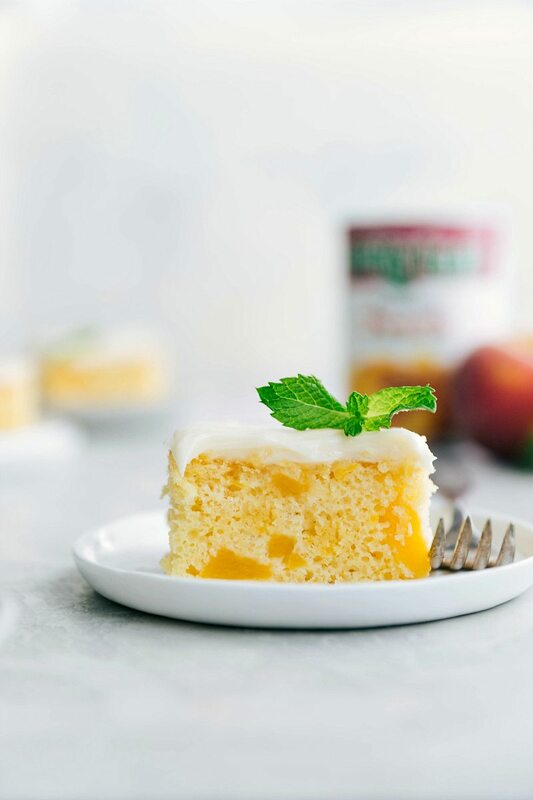 I’ve never tried making a peach cake before…this would be perfect to make for them! Hi Chelsea, this looks and sounds delicious! Just wondering if you refrigerate it? Thanks! Hi Chelsea! My family and I loved this cake. I made it with no modifications. It was so easy and came out so well. I had never heard of this brand of peaches, but there it was in my grocery store. I just asked my Mom (my resident food critic) to give me one word for how the cake tasted. She said. “Delicious”. I think that says it all. I made this with Lucky Leaf’s canned apples instead of peaches. I just put them in a bowl and chopped them up a little bit and then added to the cake batter. I love this recipe, and so does everyone I make it for.